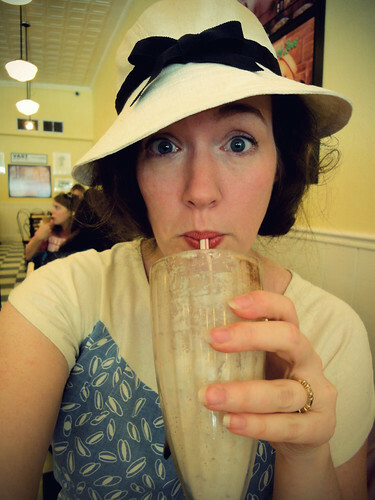 Festive Attyre: Retro Ice Cream Fun! 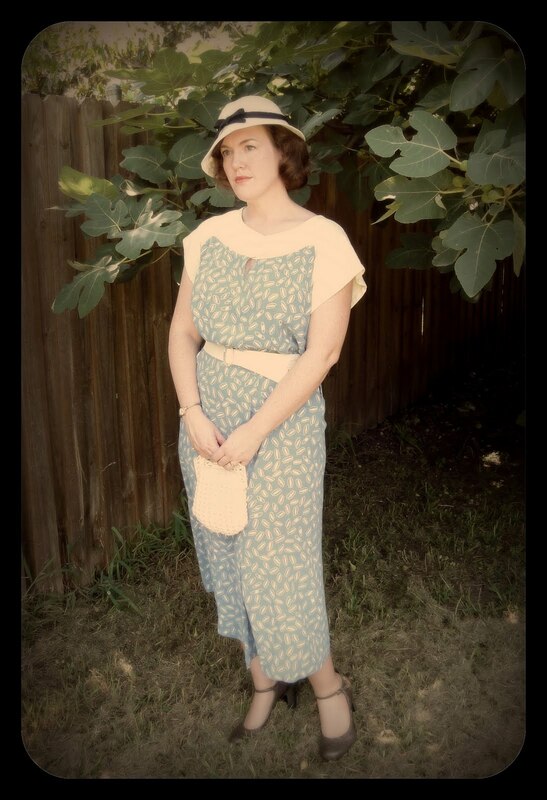 Yesterday was the DFW Costumers' Guild 20th c. Vintage Ice Cream Social. I'm starting to sound like a broken record after every event, but once again, I had a blast!!! We had a really great group of people come out for some sweets, shopping, and socializing, and everybody looked fabulous in their retro outfits. You can find all of my photos from the afternoon on flickr. 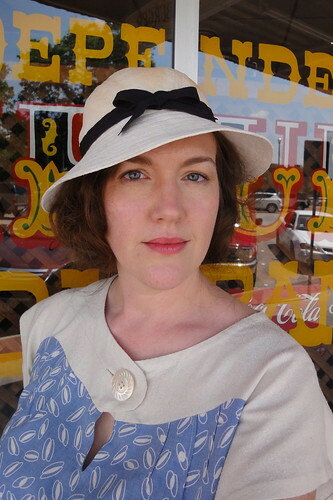 For my costume, I decided to make my first foray into 1930's fashions. 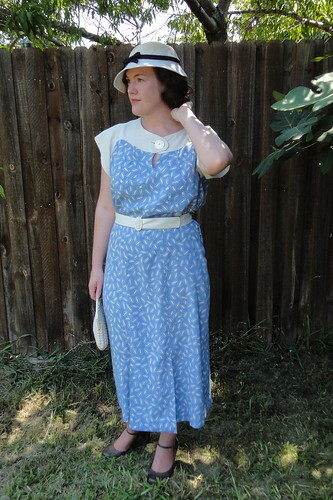 I used one of my recent lucky pattern finds - a mid-30's Anne Adams day dress. I used some vintage rayon that I had in my stash for the dress, and I bought some silk noil for the contrasting sections. The button and buckle are vintage mother-of-pearl. This dress was a dream to put together, and I didn't even have to do any alterations other than lengthening the bodice by an inch. And I am happy to report that my second version of the hat tuned out much better than my first. It is made out of heavy linen and I used the brim pattern from the first hat and the crown pattern from the second hat in these directions. I interlined the brim with heavy interfacing, and I wet the whole hat and let it dry while stretched over a hat block to make it nice and smooth. I'm so glad I stuck with it - I think the hat is my favorite part of this outfit! So after my first time wearing 1930's fashions, I must say that I'm hooked! It was such a fun dress to wear, and I felt both glamorous and relaxed at the same time. I'll definitely be making more outfits from this era in the future! I LOVE this dress! 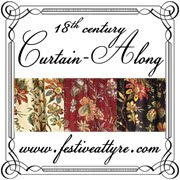 Great job and what a fabulous pattern (coupled with wonderful fabric!) The ice cream social sounds like it was fun!! That fabric is perfect! I love the dress. And the hat, of course. very pretty~ I think it looks comfortable and elegant at the same time. the dress looks so good on you! i like the contrasting top and sleeves. You look so lovely. You really pulled off this look. The hat looks great and is perfect with the dress. The top photo of you is great--so pretty, and so period! Both hat and dress look fabulous :) Where did you get a hat black to block the hat with? I love how flattering this is on you! 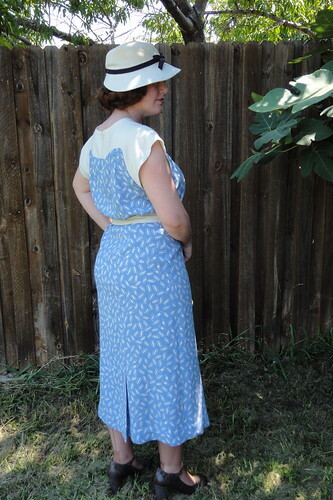 I love the 1930s silhouette, but was not convinced it would look good on me, so I've shied away from making anything. Now I'm inspired! Cute outfit! Thanks for the shout out. You look so beautiful in your 30s dress. It's the decade for you! And I can't believe you made that hat!